In 2012, activists with PhillyNORML, a local chapter of the National Organization for the Reform of Marijuana Laws, uncovered that 80 percent of people being arrested for marijuana possession in Philly were those of color. According to the Pennsylvania Uniform Crime Reporting System, no other crime in the city, including possession of heroin and cocaine, showed such a trend in racial disparity. This led the group to not only challenge the local law, but also the notion that legalizing marijuana in Philly would somehow be a scourge on the city. “We wanted to decriminalize this,” says Richard Tamaccio, a 35-year-old comedian and activist better known by his stage name N.A. Poe. “We’re trying to find a way to stimulate the economy in Pennsylvania,” says Poe, who’s probably one of the most vocal pro-pot advocates in the city. He’s currently on probation for an arrest stemming from his appearance at a local pot legalization rally (Smoke Down Prohibition) in May 2013 at Independence Hall. Poe, from South Philly by way of Overbrook, emceed the event on the day of his arrest. And at 4:20 p.m., he led a countdown and lit a joint in front of, as it turns out, law enforcement officials from five different federal agencies. After lighting the joint, he says he was subdued, tackled and hog-tied by three park rangers before spending almost a week in federal lockup and paying as much as $3,000 in fines. Given his history (he makes people laugh for a living) and his in-your-face tactics, Poe’s approach to the debate may be considered a little unorthodox. But he’s getting things done. After running (unsuccessfully) as a Libertarian candidate for City Council on a pro-cannabis platform (he also wanted to disenfranchise the Philadelphia Parking Authority), he’s become an unlikely hero to the movement, someone who has, against the odds, made significant in-roads into the local government. He’s even put on a suit to visit City Hall. And he’s learned a few valuable lessons in lobbying his cause along the way. All told, Poe’s been spreading the message of big revenue at more than 20 different pro-pot rallies throughout the state, as well as in New Jersey and Boston. He’s also been to federal court six times for the cause, he says, as a way to spotlight not only his platform for recreational use, but also the need for medical marijuana legalization in the city and state. Marijuana has a long history. Rumor has it a few of the Founding Fathers enjoyed lighting up. George Washington was a big fan of hemp, encouraging Americans to “sow it everywhere.” Native Americans also used a lot of hemp seed, both in their peace pipes and in foods and medicines. They weren’t alone. Most world cultures have enjoyed the benefits of hemp; it was cultivated in China as early as 4,000 B.C. Despite his die-hard beliefs, he’s not foolish enough to believe that a bunch of stoners petitioning City Hall or Harrisburg will effect change. “It’s going to take vets with PTSD and mothers fighting for their sick kids to make a difference,” he says. That’s why Poe’s been working with others from PhillyNORML, including Chris Goldstein and Anne Gemmell, a former Philadelphia School District teacher, as well as Councilman James Kenney, who sponsored a very pot-progressive bill in Philly. The ordinance changes what would have been a misdemeanor narcotics offense into a summary citation (the equivalent of a traffic ticket) for pot possession. Anyone who is found to have 30 grams or less of marijuana will be cited and fined $25. The fine for smoking in public is $100 or nine hours of community service. “We hope young people will be spared the life-altering consequences of a criminal record,” Kenney said when the bill was signed into law in October. After just a month, custodial arrests in the city were already down by 78 percent compared to the same time last year. In 1997, Chris Goldstein was on a public radio station in New Mexico when he launched a popular segment dedicated to marijuana news. “I thought it might be a fun idea to start reading the NORML weekly press release,” he says. Eight years later, NORML came up with the idea for a podcast designed to reach even more listeners. An instant hit, at the height of its popularity, the podcast had more listeners than the White House and Pentagon weekly press briefings, and Goldstein began digging into the issue of marijuana legalization seriously, hoping to create an educational and entertaining platform. A steady stream of politicians, scientists, activists and celebrities made appearances on the show. Since then, a lot has changed for the 38-year-old. Returning to his native New Jersey (which opened its first medical marijuana dispensary in 2012), he began volunteering locally for marijuana law reform alongside Poe, serving for about eight months as executive director of PhillyNORML. Goldstein, it should be noted, is also currently on probation after lighting up at Independence Hall last year to mark the 75th anniversary of the first federal marijuana arrest. He and Poe, two of the most provocative pot crusaders in the city, first met while camping out at City Hall during Occupy Philadelphia. That movement may have died down, but the camaraderie they forged ignited a new mission. Around the same time they began their work, Colorado and Washington legalized recreational weed. The pair’s ongoing Smoke Down Prohibition initiative is being compared to erstwhile efforts to overturn the ban on alcohol in the early part of the 20th century. Not only has cultural acceptance been growing, but medical benefits also have been showing promise. Eighty-five percent of Pennsylvanians support legalizing medical marijuana, while nearly 50 percent are in favor of legalization of the so-called recreational use of pot (that number jumps to as many as two-thirds for Pennsylvanians ages 18-29), according to a Quinnipiac University poll. Poe calls marijuana legalization the new gay marriage issue. Putting faces to the cause has helped, as both Goldstein and Poe have discovered first hand. In Philly, there are also quite a few new faces moving into the limelight to legalize pot (and, more to the point, to make money should legalization happen). Michael Bronstein of Bronstein & Weaver in Bala Cynwyd, for example, has been lobbying to pass pot-friendly laws with the American Trade Association for Cannabis and Hemp. If he’s successful, then folks like Claudia Post may have a booming business. She recently launched Smokin’ Hot Consultants, a boutique marketing firm that provides services to would-be marijuana moguls. If anyone has any doubt what the firm is all about, there’s even a lit joint on the company’s logo. There have been detractors along the way, of course. Anti-drug activists have been just as proactive about speaking against the legalization of marijuana on both the federal and state levels. There also have been discussions about age of consent and distribution – important talks to have whatever the outcome. And in Harrisburg, there’s Rep. Scott Perry. New to Congress, he introduced the “Charlotte’s Web Medical Hemp Act of 2014,” a bill that would amend the Controlled Substances Act to exclude therapeutic hemp and cannabidiol. His bill is named for Charlotte Figi, a girl in Colorado who was having grand mal seizures that left her unable to walk, talk or eat. After trying many different medications, she found relief in the form of a marijuana extract that also has been showing promise among people with asthma, glaucoma and cancer. Poe believes that stories like these could change the way most people, even the toughest anti-drug critics, think about cannabis. It’s nothing new. As early as 1859, a western doctor named W.B. O’Shaughnessy wrote about the benefits of the drug for the treatment of rheumatism and epilepsy. And in the 1600s, the “Anatomy of Melancholy” recommended it for the treatment of depression. Even the colonists in Jamestown grew hemp. In fact, it was the law. The General Court of Hartford in 1637 required all families to plant one teaspoon of hemp seed. Activists like Goldstein and Poe cite another important feature to marijuana legalization: economic stimulation. Since marijuana was legalized in Colorado (the first state to do so), the state has reaped $18.9 million in taxes within six months, according to the Department of Revenue. Washington, meanwhile, has earmarked 81 percent of revenue from marijuana sales to build schools and promote drug education and expects to raise $3 million in additional taxes from pot sales alone. If cannabis is legalized in Pennsylvania, Poe says the state could conceivably enjoy more than an estimated $100 million in revenue. The decriminalization of small amounts of the drug in Philadelphia is estimated to save the city as much as $4 million in the next year, says Goldstein. There are really two wars being waged – one is for recreational use, which is slower to attract political support, and the other is for medicinal use, which is proving to find favor among those in the medical community and becoming what many politicos might call a “safe” bipartisan issue to support. Case in point: A researcher at the Veterans Affairs Medical Center in Philadelphia reported that states with active medical marijuana programs have seen a 25 percent drop in opiate overdoses. 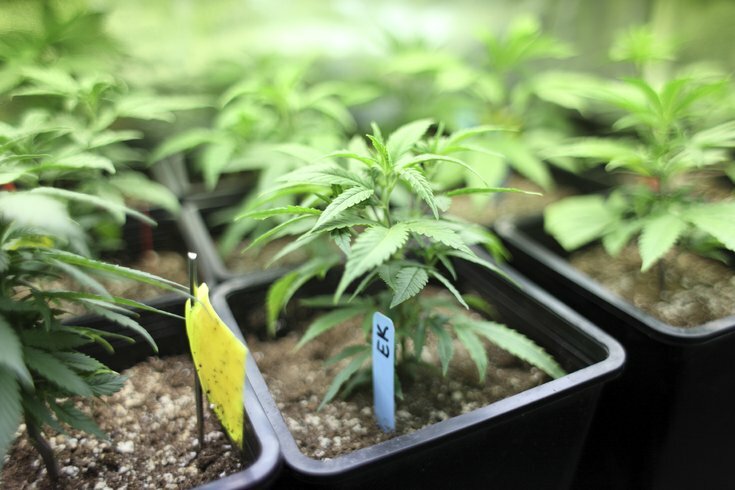 Could legal medical marijuana solve the problem? Goldstein and PhillyNORML sure think so. Many veterans groups have joined their cause, pushing for medical marijuana to treat physical and emotional pain rather than drugs with sometimes adverse side effects and addiction risks. Cannabis already is being used to treat a range of symptoms related to diseases like multiple sclerosis, cancer, epilepsy, lupus and HIV/AIDS. As of press time, 23 states and the District of Columbia currently allow medical marijuana, according to the National Conference of State Legislators. An additional 11 states have limited access to medicinal products with low levels of THC (the active ingredient in the drug). The Marijuana Policy Project, a national organization that lobbies to end the prohibition of use, also is pushing ballot initiatives in a few other states. Is full marijuana legalization in Philly’s future? Washington D.C.’s most recent model for marijuana legalization has caught the attention of pro-pot advocates in Philadelphia for a few reasons, namely that it seems to be working legally and economically. D.C.’s new law also will challenge Congress to address the issue because it ultimately oversees the district’s budget, which ushers in a lot of questions about accountability, revenue and the federal government’s role in all of this – all of which have been sticking points in states that have legalized the drug. There’s much to consider, as Pennsylvania could be gearing up to pass a much more restrictive medical marijuana bill in 2015 compared to the law in D.C.
“This will leave many patients behind and arbitrarily exclude smoking and vaporization,” explains Goldstein. It’s the same version of the law that passed the state senate earlier this year. Does that mean marijuana legalization is doomed in Philly? Not necessarily. Sen. Daylin Leach has proposed a full legalization measure in the state. His bill would allow the sale of cannabis in state-run liquor stores, an idea being used in other parts of the country. But pro-pot activists wonder if the model is a bit antiquated considering the tough Blue Laws that already govern liquor sales in the state. Would marijuana be available on Sunday? If this issue really is the new gay marriage, as Poe says, then it may require other states to take the plunge first. Pennsylvania’s legislators were slow in accepting marriage equality despite widespread opinion polls showing support among voters and despite neighboring states like New Jersey, Delaware and New York passing some sort of legislation. In the next two years, it’s predicted that several more states likely will hold ballot referendums on the issue and, Goldstein expects, will pass them. It’s worth noting that in Pennsylvania and New Jersey, a powerful opposition to cannabis has come from lobbyists. Big Pharma is still among the top contributors to Republican candidates in Harrisburg and has a lot at stake should marijuana compete with prescription drugs that net billions in revenue. Marijuana legalization isn’t just an ethical or medical debate – but a financial one as well. Should legalization move forward, a few notable locals are ready to make the most of it, like David Dinenberg, the owner of KindBanking. The startup is designed to provide financing to the legal cannabis industry. Long a cash-only industry, Dinenberg and his partners (Lindy Snider, daughter of Flyers owner Ed, is one of his investors) would like to revolutionize how professionals interact with customers and investors alike. If you think it’s just another pet project, consider that Dinenberg has worked with high-profile clients in the past, including Donald Trump. Meanwhile, it’s the aptly named “grassroots” efforts that are changing the game and are enticing supporters to speak out and voters to weigh in on the issue.